1. My Jack Lalanne's Power Juicer The reviews on Amazon are mixed but it's been great to work with. If and when it goes, I may venture out and try another brand. I love the look of the Breville models. 2. My food scale. It's an indispensable tool for baking, when precision is needed and it keeps my portions of energy dense foods in check. 3. My Microplane Grater/Zester. You ever wonder why Giada DeLaurentiis looks so happy when she zests a lemon? Because she's rich and famous lemon zest is awesome! It adds flavor to just about anything without adding any fat, salt, sugar or calories. And the aromatherapy benefits of zesting any citrus fruit are fantastic. 4. My mortar and pestle. I always feel like the ladies from Practical Magic when I get my hands on this beauty. I use it to make flavorful pastes with dry spices, fresh garlic and ginger when I cook Thai or Indian food. It's also great for making homemade salad dressing, try garlic, lemon zest, lemon juice and evoo and that salad will sing. 5. My knives. It took me a long time to realize that I only need 3 good knives in the kitchen, a good quality chef's knife, a really good paring knife, and a serrated blade for slicing bread. I picked up my Icel chef's knife at a local kitchen supply store. It was worth the splurge. I keep it sharp and use it every day. 6. My 20 Oz. 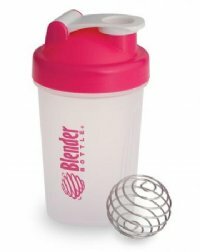 Blender Bottle. This is a fun gadget. I use it for my pre-workout protein shakes. But you can use it to make salad dressing and pancake batter, too. I toss in a some ice cubes with the protein powder and raw milk and out comes a creamy, frothy and filling shake. 7. Zip N' Steam Bags. It makes getting my veggies when I'm on the run so easy. 8. Last but certainly not least is my Cute PDF Writer. How does this help me in the kitchen? Well, the Internet is a vast resource for recipes. But how to organize and store all these recipes you want to try? Bookmarking is unwieldy, printing is costly and copying and pasting is time consuming. Enter the Cute PDF Writer, which Rob found for me. When I find a recipe I want to save, I hit "print" and use the PDF writer option instead of my printer. It saves the recipe as a PDF file. I have literally hundreds and hundreds of recipes that I've stockpiled over the years all organized in a recipe folder on my desktop. It's easy to search and organize recipes this way. I hope this list has been helpful to you. What are your top kitchen gadgets? Note~these are independent reviews and not paid promotions from the companies. I am a member of the Amazon associates program, so if you click through my blog, I do get a small credit for that. That PDF writer is very cool! I love my Magic Bullet blender. It was gifted to me and I use it almost daily! Some in common with you. Brown lunch bags. I use them for making popcorn in the microwave. I eat a lot of popcorn. My best kitchen tool is the I Pod. I had gotten avoident of the kitchen. I ate fast food for every meal. No one cooked. It was too lonely to be in the kitchen when everyone else was in another part of the house. Then I plugged in the I Pod in a permanent spot in the kitchen. I found my brain soothed. I danced, I sang and I ACTUALLY COOKED. That helped quite a bit - well that, and a really good paring knife! Oh, and the George Foreman Grill. I am in love with it. I love seeing everyone's kitchen faves! Granny Pants...I like my George Foreman, too. It makes great grilled stuffed burritos and pressed sandwiches!